According to the Diary of the 102nd Field Ambulance, July 1st 1916 was clear, bright and warm. The 34th Division, positioned between the 8th on its left and 21st on its right, with the 19th Division in reserve, was allotted the task of capturing the village of La Boiselle and the region to the east. The 101st and 102nd Brigades, with the 101st on the left, were to carry out the initial attacks, with the 103rd in support. Orders issued to the 3rd Battalion Tyneside Scottish show that the 1st Battalion, supported by the 2nd, would attack from the north end of the Brigade's trenches, along Mash Valley, and the 4th, supported by the 3rd, would attack from the south, along Sausage Valley. Both pairs of Battalions were expected to advance to positions some 1200 to 1500 yards behind the German front lines. This was a change from the original plan, as 102nd Brigade Operations Order No.32, of 19th June 1916 indicated that the 2nd Battalion would move forward followed by the 3rd, and the 1st followed by the 4th. The two huge mines, one under the German front line in Mash Valley, the other in Sausage Valley, exploded at 7.28 am, two minutes before the attack was due to commence. 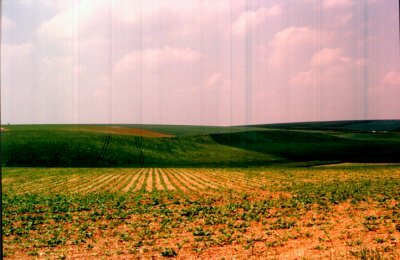 The mine in Mash Valley consisted of 20 tons of ammonal, the other, whose effects can still be seen as the Lochnager Crater south of La Boiselle, contained 30 tons of the explosive. The 4th and 1st battalions immediately began their advance, the 2nd and 3rd waiting two minutes for the debris of the larger explosion to clear. The men advanced as they had been ordered, in four columns consisting of platoons from each Company. The men were two paces apart, and the next line was 150 yards behind. All four Battalions of the Tyneside Scottish were led over the top by their pipers, proudly playing the instruments which had so generously been provided by donations from people back on Tyneside. Each man was expected to be carrying his rifle and equipment, except for the main pack; 2 bandoliers of Small Arms Ammunition as well as his own equipment ammunition, making 220 rounds in all; 2 Mills grenades; 1 iron ration and other rations fro the day of the assault; a waterproof cape; 4 sandbags (presumably unfilled); 2 smoke helmets and picor goggles in case of gas attack. Haversacks were to be carried on the back. As many men as possible were to carry wire cutters, and picks and shovels were to be distributed evenly among the soldiers. In addition, men in the second waves also carried reels of telephone cable, signalling equipment and other impedimenta. Many were so loaded down they could hardly walk. All men of the Brigade were to wear a distinguishing mark on their backs in the form of a yellow triangle with 16 inch sides, base uppermost. Packs greatcoats and waterproofs sheets were not to be carried into the attack, but were to be labelled with rank, name, initials, number, regiment and brigade. These articles were all to be stored in Albert. The men were reminded that iron rations were only to be eaten with definite orders from an officer. The officers were instructed to ensure that only one ration per three men was opened at first, although more could be opened at the commanding officer's discretion. The number of iron rations used was to be reported at the first opportunity to Brigade Headquarters. All ranks were warned that on no account must food be eaten or water drank which was found in the enemy's lines until after it had been declared uncontaminated by Medical Officers. At least one enterprising officer of 34th Division took matters further than these orders suggested. A certain Colonel Rose was a water diviner, and managed to locate the position of water supplies at comparatively shallow depths, a great help as most of the wells in the area had been filled in or were foul. The Army Service Corps dug wells or made borings in places indicated, and so greatly relieved the problems of water shortage. The intention was that, as the men advanced, they would be preceded by a 'creeping barrage' of artillery fire, planned to move forward at a steady pace, thus ensuring that the enemy would remain under cover until the infantry were almost upon them. To make sure that the artillery did not fire on its own troops, the leading waves were to light flares at 15 second intervals to show where the front line was. As men moved past these, they were to be stamped out. The creeping barrage was, in the event, an almost total failure for a number of reasons. The depth and protection of the German dugouts had not been realised, and most of the men in the enemy's front lines were unaffected by the bombardment. The creeping barrage was worked out so precisely that it was almost impossible to alter whilst in operation, and it rapidly moved well ahead of the advancing troops. Also, as one ex-officer wrote in 1930, in a letter to Brigadier-General Edmonds, the compiler of the official History of the war, "...the barrage of 3rd Corps front was made to jump from one trench system to the next. We did not realise the Germans would be driven out of their trenches and would occupy their shell holes with machine guns and riflemen. It was this defence, combined with the concrete machine gun emplacements, especially round Ovillers, that caused the trouble on the first day owing mainly to the fact that the barrage jumped from one trench to another and did not touch the shell holes. The second point was that we did not in the least realise how slowly attacking troops must move in fighting of this description." were encountering problems of their own. 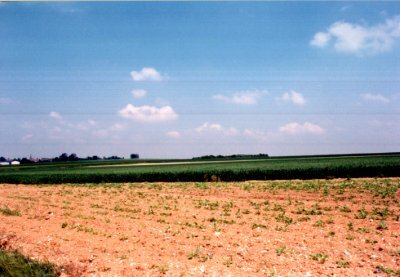 The 18th Northumberland Fusiliers, the Tyneside Pioneers, were in the region of Becourt Wood when the advance began, with orders to move supplies forward to keep up with the advance. This was found to be almost impossible due to the congestion in the forward trenches caused crowds of returning wounded. Several of the unit's men were themselves wounded by shrapnel, and at least one officer was killed when he climbed out of a trench in order to try and find a way through. and crossed the track running between Becourt and La Boiselle. The men were then meant to continue their advance up the opposite slope. One company was detailed to dig a communication trench across No-Man's Land, but found this impossible. A shallow gallery had been occupied the night before, but when men under Lt. Nixon tried to open the end of this as a line of communication they found 12 feet of earth above them instead of the two they had been led to expect. The platoon started digging at midnight and eventually broke through sufficiently to allow cables to be passed through by 8.30 a.m. A communication trench eventually reached the enemy front line at 7 p.m.
208 Field Company Royal Engineers was attached to 3rd and 4th Tyneside Scottish with orders to move forward immediately behind the advancing infantry and begin constructing strongpoints. In the event, the heavy artillery and machine gun fire meant they did not even get into No-Man's Land, suffering several casualties. The 102nd Machine Gun Company moved forward with the initial advance, but immediately began suffering casualties, mostly by machine gun bullets in the legs. Several officers were wounded, and the company lost 3 of its 16 guns. Men and guns were frequently buried under earth and debris, but each time managed to dig themselves out and continue firing. The farthest advance on the 102nd Brigade front was made by a small group of men from the 2nd and 3rd Battalions who managed to reach the third line of German trenches but were forced back by heavy enemy fire. Major Acklom, now acting Commanding Officer, had gathered these together by 8 a.m., a total of 7 officers and 200 men, at that time the total effective strength of some 2,000 men who had climbed out of the trenches some 30 minutes earlier. The 1st and 4th Battalions had suffered similar casualties. In half an hour the Tyneside Scottish Brigade had virtually ceased to exist.The small force under Major Acklom managed to hold a section of enemy trench, between the larger mine crater and the village, along with part of the tunnel which had been dug when the mine was prepared. Between 8 a.m. and 12.45 p.m. the small group of men managed to repel six attacks on their exposed flanks. Captain Fortune, commanding 'D' Company of the Tyneside Pioneers, along with 2 Lt. Dodds, took a party laden with bombs directly to the crater at 1 p.m. (Lt. Dodds continued supplying the men in the crater until they were withdrawn on the evening of July 3rd.) Another group from the Pioneers also supplied the crater with water, rations and small arms ammunition. 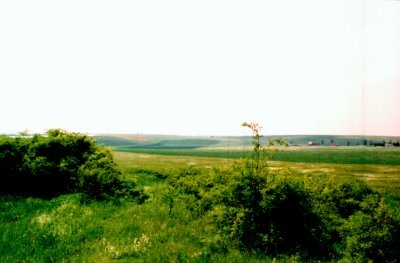 A group of men from the Lincolns, under 2nd Lieutenant Turnbull, had established themselves in a crater about 100 yards south of the Tyneside Scottish position, in an area referred to as Scots Redoubt, and contact was made with these in the afternoon, so strengthening the position somewhat. Despite the enormous number of casualties on the battlefield, 102nd Field Ambulance had a comparatively quiet day, due no doubt to the difficulties which were being experienced in removing wounded from the trenches. They were, however, ordered to despatch motor ambulances to 103rd Field Ambulance at Moulin Vivier (they sent 2 Talbots), and 104th Field Ambulance at Dernancourt (2 Talbots and 1 Ford were sent). At 6 p.m. the officer commanding visited Dernancourt and on his return transferred two horse-drawn ambulances and two General Service wagons to their assistance, along with Lt. G.M. Thomas and ten 'temporary unfit' patients. held out for nearly three days. Very little happened for the rest of the day, and after dark the group managed to make contact with other troops who were holding the crater left by the mine. 4th Army Headquarters were more or less unaware of the situation for several hours. The Summary of Operations record has an entry timed at 10.11 a.m. which states "102nd Bde. reports that Brigade signalling officer was in Boiselle and it appears to be clear of enemy. Possibly a few still remain in dugouts on east side." This report undoubtedly stems from an incident related by Ternan in his book about the Tyneside Scottish. 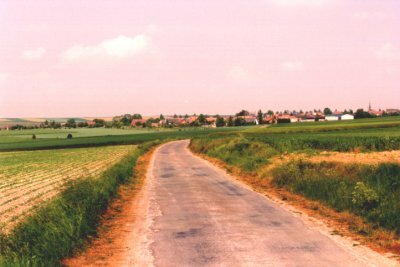 Lt. Dowse, the 102nd Brigade's signalling officer, had orders to lay telephone lines as soon as La Boiselle had been captured, ready for the move there by Brigade headquarters. In fact, he moved off as soon as he saw British troops in the German front trenches. With two orderlies he walked along the Bapaume road and into the village, which was more or less empty. Realising his mistake, he removed as much equipment as possible from a German dugout, and proceeded back along the road. One of the orderlies was, unfortunately, killed. As a commentator after the war pointed out, if the plans had been more flexible, and communications between front lines and headquarters better, La Boiselle could probably have been captured on the first morning with considerably fewer casualties. At 3.10 p.m. there was an unconfirmed report from 34th Division that its right flank was consolidating in Contalmaison. This report probably arose from the action of a group of some 30 men of the Tyneside Irish, led by a junior officer, who had not received the order to cease advancing, and had decided to press on to their first objective. Having advanced 4,000 yards from their start point, and now being 2,000 yards inside the German lines, they had advanced farther than any other British troops on the first day. 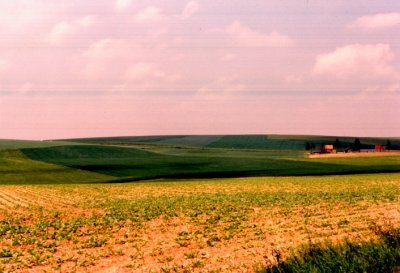 Unfortunately they were overwhelmed by the enemy and wiped out.By early evening 4th Army HQ began to appreciate the situation, and ordered an attack on La Boiselle by 19th Division, timed to start at 10.30 p.m. Similar things were happening all along the British front. At the end of the first day, General Rawlinson was given a casualty figure of 16,000, but it was not until the 1920's that the full numbers were calculated. It would appear that 57,470 men, half the attacking force, were killed, wounded or captured. 30,000 had been lost in the first hour. Kitchener's New Army, which had taken two years to create, was destroyed in twelve hours, 30,419 of the volunteers being casualties. On the other side, the Germans lost some 8,000 men, although this was to rise later. The only real success was made on the right of 4th Army, where the 30th, 18th and 7th Divisions attacked alongside the French. These Divisions were mainly Regular Army, and the troops and their leaders were experienced and flexible enough to alter their plans to suit the situation, for example halting the initial attack to allow a re-bombardment and for fresh troops to take over the lead.